Clean attics while not a normal part of a house cleaners job, could be big business for you during your slowest months. Here are some things to consider before you bid an attic job. 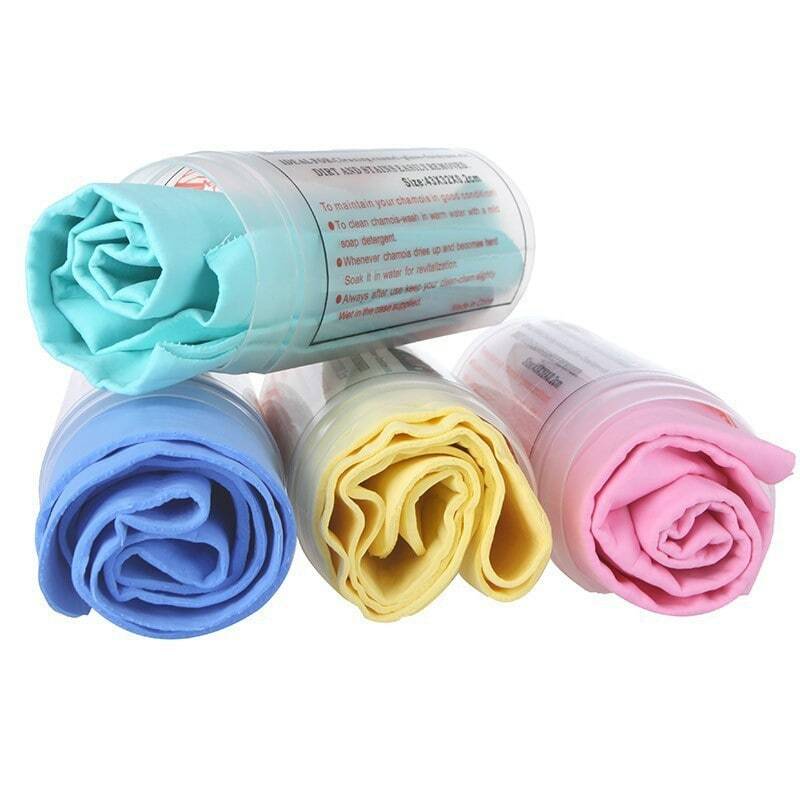 or special cleaning categories and is something you will never do on a routine cleaning. Unless of course the family has finished the attic and is using it as a room of the house. Only once in 25 years of cleaning has that ever been the case for me. Most people never go in their attics except to store holiday ornaments or stuff they can’t part with. Because attics are insulated, they are hot in the summer and freezing in the winter. Heat rises and then it gets trapped in the attic. If you have a choice, clean the attic during the cooler months of the year. 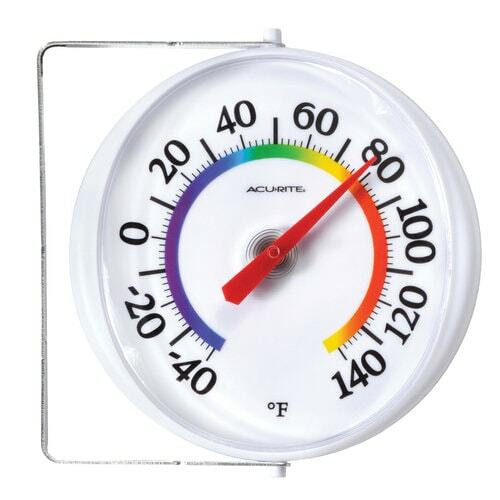 Avoid the hottest and avoid the coldest months of the year. Depending on what part of the world you live in you will need to determine – the perfect month or two to clean an attic. You can sell attic organization as a special service. Let your customers know that during the months of February and March (or whatever you choose,) you will be running a special. This is a great way to pick up extra business from your existing clients. Heck, you might even pick up some new clients during your slowest months of the year. Even the cleanest of homes can catch rodents in their attics. Under the roof, there are vents that let out air, condensation etc. Outdoor rodents such as mice, rats and sometimes birds will find their way into the attic hoping to escape the summer heat or the winter cold. 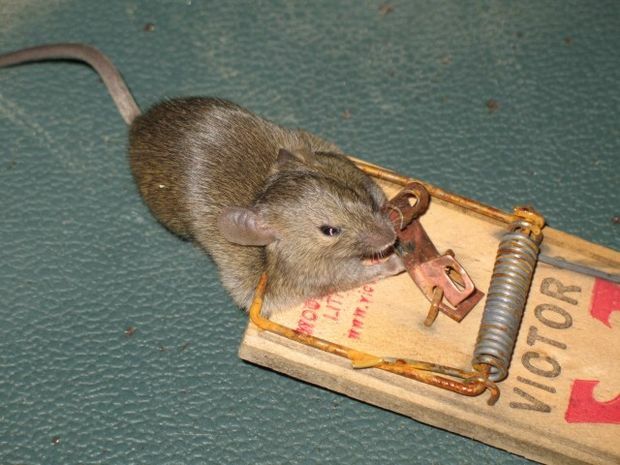 Expect to find dead rodents or traces of live rodents in an attic. Of course, if you see a dead rodent you’ll need to scoop it up and dispose of it. A good way to do this is with a plastic grocery bag. Turn the bag inside out, and pick up the dead mouse or rat. Then toss the bag in a bigger garbage bag. For this reason, it’s a good idea to wear your gloves when cleaning attics. 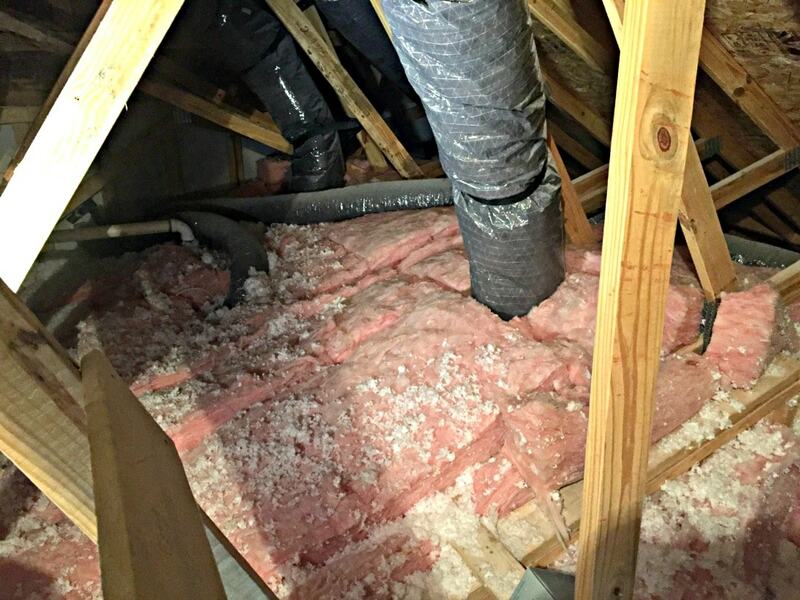 The insulation in attics is often blown or spun fiberglass. Either way, it could cause allergies and if you rub up against it, it could make you itch. For this reason, it’s a good idea to wear long sleeves and long pants when cleaning an attic. I’ve never been in an attic that wasn’t dusty and musty. People store books and cardboard boxes in their attics. And all kinds of other things they shouldn’t store in non-climate controlled spaces. 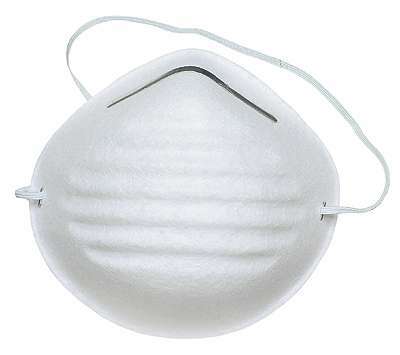 For this reason, it’s a good idea to wear a face mask to prevent inhaling it. 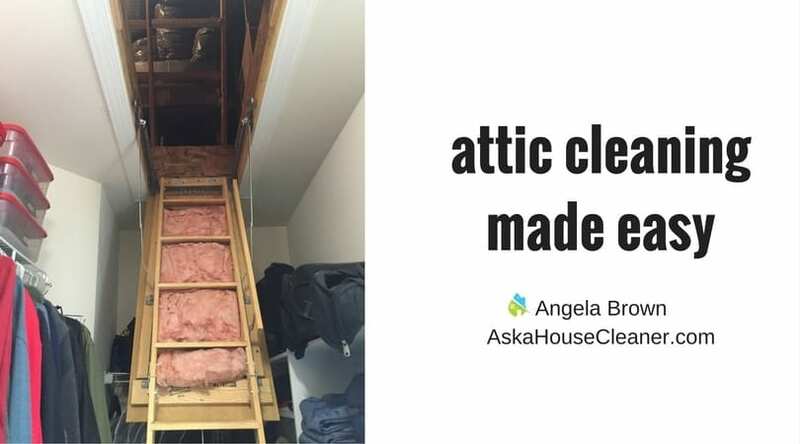 When your clients decide to sell their home, they may ask you to come clean their attic so it will be in “show” condition. This means you may have to fight the heat – or the cold. If you end up cleaning an attic in the heat of the summer – make sure you bring a cooler of water to drink so you don’t dehydrate. 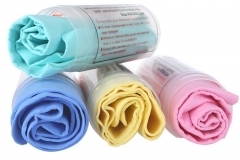 You usually find these wet, super absorbent chamois in the automotive department. And they work wonders for keeping your neck cool in the dead heat of the summer. Just wet it and toss it in the freezer in the clear plastic container it comes in. Keep it in your cooler until you arrive at the job. Once you get in the attic take it out of the cooler and plastic container, and wrap it around your neck like a scarf. You can hold it together with a hair elastic. This will keep your neck cool and keep you from overheating. If it dries out during the job (It usually takes about 1-2 hours before it does,) you can put it back in the plastic container and pour a bit of cold water on it. Shake the container so the chamois absorbs the water and then put it back on your neck. The attic of a home is usually a catch-all for a lifetime of memories. People store stuff they can’t part with but will never use again. Often there is a story attached to every item in the attic. Like it or not, if the client is helping you clean and sort through stuff in the attic, you are going to hear some stories. They will tell you about heirlooms they are storing from their grandparents, their parents and their kids. The stories bring out nostalgia. Happiness and pain. And it all consumes time. For this reason, you need to bid the attic by the job, not by the hour. You will be there much longer than you expect. If there are ceiling fans, lights, or windows – you’ll want to dust those areas for cobwebs. A Swiffer Duster will do the trick, but if you have access to a shop vac – this is a good time to bring it out. The right hose attachment is great for hard-to-reach places to clean up dust, cobwebs, and traces of rodents. There won’t be lots of “cleaning” usually more organizing in an attic. Keep your Swiffer Duster with you and dust off furniture, paintings and other things that have collected dust over the years. One of the reasons people will hire you to clean an attic is to help them create more space – this means giving them permission to get rid of stuff. Plan on making three piles. The recycle pile can be things your client is going to sell on eBay. Or stuff they plan to donate to a thrift store or consign. Recycling things your client will never use reduces the pain of junking stuff with sentimental value. In every attic you clean, there is stuff the client is going to want to keep. Organize so it’s easy for the client to find when you’re not there. Arrange all the Christmas ornaments together. Put all the antiques together. Organize all the keepsakes for the kids together – you can separate them by the child if it’s easier. This way when they pass these valuables along to their kids. It’s easy to find. One woman had a plastic bin with all the homework assignments for each school year. For each of her children. She had four children. 12 years of schooling = 12 bins of homework x 4 kids. 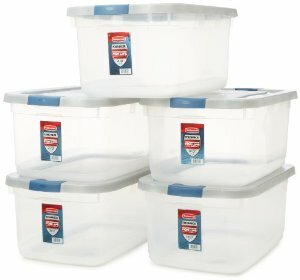 She had 48 big plastic bins of homework in her attic. This was consuming a lot of space. She had a tubs of their favorite outfits, accessories and favorite toys for each year they lived at home. 18 years of favorite outfits, accessories, and clothing per child x 4 children = 72 bins of childhood memories. All labeled and preserved for posterities sake. 120 bins of just her kid’s stuff. We separated the bins by the kid and then contacted her kids to come pick up the bins. She was sure her kids would kill to each have 30 bins of stuff they had outgrown and had already said goodbye to. With all due respect, she was trying to do right by her family. But getting rid of 120 big plastic bins in her attic was liberating. She felt so relieved that the duty of saving her kids things was now complete. She was free to move on to other activities. That feeling is what the clients are buying when they hire you to clean their attics. And trash is different for everyone. You’ll have to let your client’s tell you what the trash is. I was cleaning one guy’s attic and he had cassette tapes for all the Sunday sermons he had watched on TV over the last 30 years. He taped them with his hand held tape recorder so the TV to tape quality was not good. 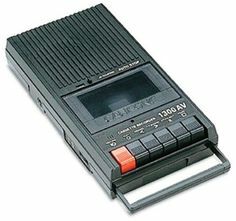 The tape recorder picked up room sounds, barking dogs, his wife talking etc. And he had never listened to a single tape. But this was the word of the Lord, and this was his way of preserving it. So he couldn’t imagine tossing 30 years of tapes x 52 sermons. All boxed and labeled, but taking up an entire wall of his attic. We talked it through. The quality of the tapes he’d made vs. the unlimited high-quality sermons now available on Itunes, Stitcher, Sirius, and Satellite. We discussed the fact that cassettes are obsolete now and so are the tape players. We called two universities and asked if they wanted the tapes – they didn’t. We called the local thrift store – they didn’t want them either. The public library wasn’t accepting cassettes of any sort. The phone calls were a gesture to help him to release the tapes without undermining his intentions. With respect, we loaded them into a van I had rented for today’s attic cleaning. And he said goodbye to his longtime purpose. The rest of the story is cruel. I drove to the junkyard and tossed them in a big dumpster, and never told the guy what happened to them. He knew. No need to rub it in. Be quick. Be kind. And help the client let go of stuff that no longer has value. 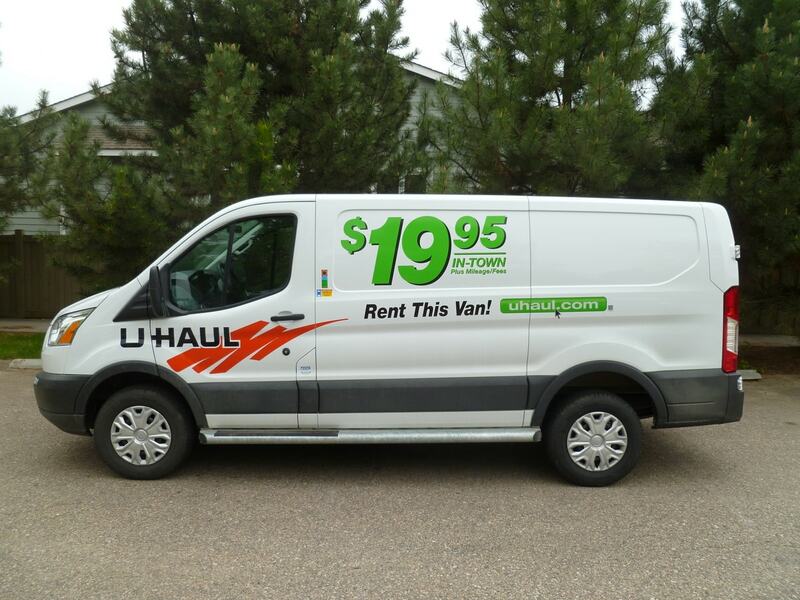 I usually rent a big sprinter van at U-haul for roughly $19.95 a day plus mileage and gas. If you do this, make sure you factor in the price of the van, mileage, and gas into the job quote. The van sits out in their drive all day. Nobody wants to haul away an empty van. I encourage the client to find as many things as they can to fill up the van. It can be from any part of the house. I offer to make two trips. I have them help me first in the attic and we carry as much stuff outside to the driveway. Then I pack the van. The van is going to make three stops. The consignment store, the thrift store and the city dump. Pack the van in that order. While I’m gone to dispose of the stuff, I drink a lunch smoothie so I’m not wasting time. I suggest the client do the same and find a bunch more stuff for my second trip. I ask them (if they are physically able) to bring it out to the driveway. It usually takes about one hour and fifteen minutes to make all three stops and unload the van. I find after a few hours, the client is in the mood of decluttering. You gave them permission to purge. When I come back for the second load – there’s usually one waiting for me. If you’re dealing with hoarders, you may need a bigger truck. 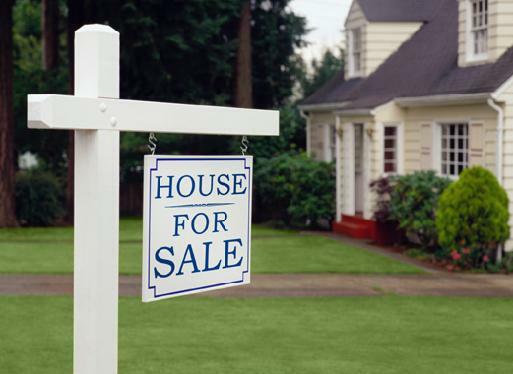 There are professional services that offer pick up and toss services. 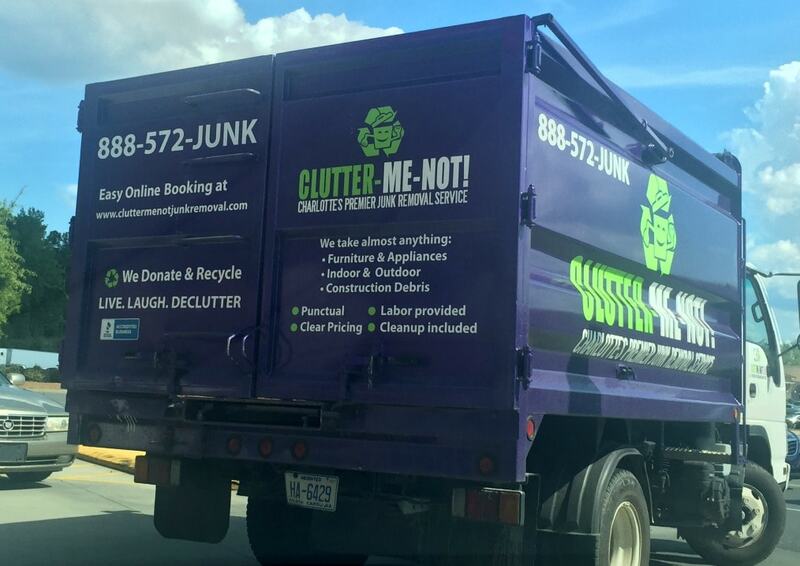 This one is Clutter-Me-Not based in Charlotte, NC. It takes furniture, appliances, construction debris, patio furniture, old plastic swimming pools etc. And they provide labor and will do the clean-up. Check your area to find similar services. If your client chooses one of these services, they will pay you and the junk service separately. You won’t build the junk pick up into your quote. Your job will stop with making a great big pile for the junk truck. Secret Tip: Limit the time you spend when you clean attics to 4 hours per day. Break it up into several days if necessary. Anything more than 4 hours is physical, emotionally and psychologically draining to your client. If you keep it short, fast-paced and efficient – you train your clients to know what to expect for the next cleaning. Don’t drag it out into a 13-hour project or longer. It will take the client months to recover and they’ll never hire you back to finish the job. Bite size pieces will let them see progress, and it will inspire them to keep going.